朱瑶丹, 韩锡萍, 陈震, 张鹏, 马鑫. XAV939对结肠癌耐药细胞迁移能力的影响[J]. 中国药理学通报, 2018, 34(8): 1083-1087. ZHU Yao-dan, HAN Xi-ping, CHEN Zhen, ZHANG Peng, MA Xin. Effects of XAV939 on migration ability of drug-resistant colon cancer cells[J]. Chinese Pharmacological Bulletin, 2018, 34(8): 1083-1087. Abstract: Aim To explore the effect of Wnt pathway inhibitor XAV939 on migration ability of drug-resistant colon cancer cells. Methods HCT-8/5-Fu cells were treated with XAV939. MTT was used to detect the sensitivity of HCT-8/WT, HCT-8/5-Fu and HCT-8/5-Fu+XAV939 cells to 5-fluorouracil (5-Fu). Transwell and wound healing assay were used to detect the ability of cell migration. The protein levels of β-catenin, c-Myc and cyclin D1 were validated by Western blot. Results The results of MTT assay, Transwell and wound healing assay showed that the sensitivity of HCT-8/5-Fu cells to 5-Fu was lower than that of HCT-8/WT cells, and the ability of migration was stronger than that of HCT-8/WT cells. Western blot showed β-catenin expressed higher in the nucleus of HCT-8/5-Fu cells than in HCT-8/WT cells. Moreover, we found c-Myc and cyclin D1 were highly expressed in HCT-8/5-Fu cells than in HCT-8/WT cells. Importantly, when treated HCT-8/5-Fu cells with XAV939, the sensitivity to 5-Fu, the ability of migration, the expression of β-catenin, c-Myc and cyclin D1 significantly decreased. Conclusions Wnt/β-catenin pathway may be involved in the drug resistance of colon cancer cells, and its small molecular inhibitor, XAV939, may reduce cell migration through affecting the resistance of HCT-8/5-Fu cells to 5-Fu. Fig 1 Effect of drug resistance of HCT-8 cells on migration ability (x±s, n=5) A: MTT assay was used to detect the sensitivity of HCT-8/WT and HCT-8/5-Fu cells to 5-Fu. 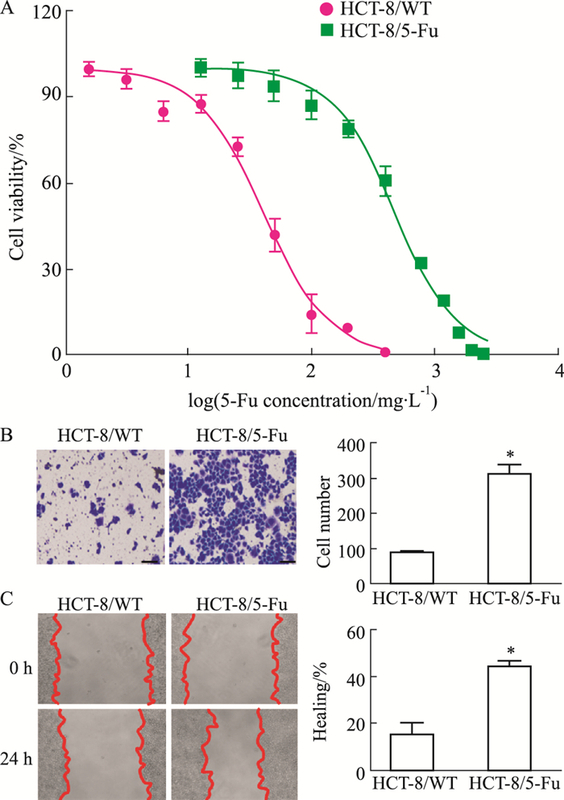 The ability of cell migration of HCT-8/WT and HCT-8/5-Fu cells was measured by Transwell assay (B) and wound healing assay (C). Scale bar = 200 μm. *P < 0.05 vs HCT-8/WT. 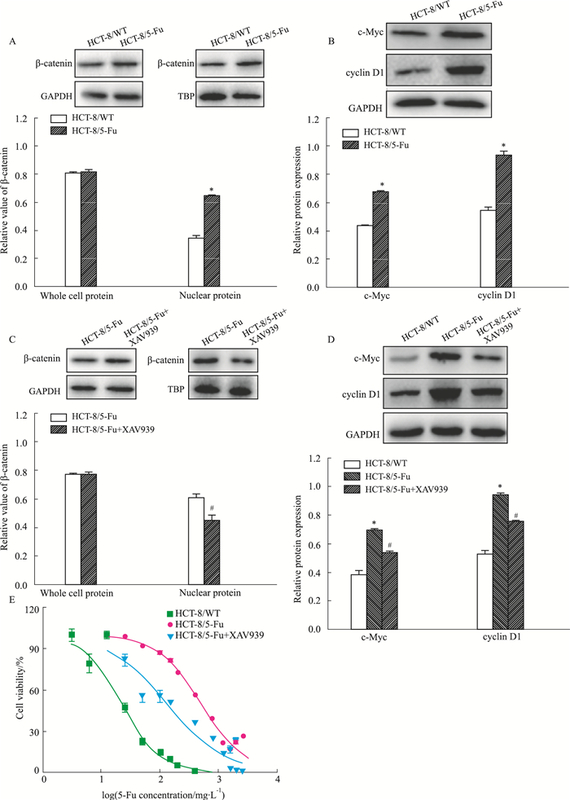 Fig 2 Effect of Wnt/β-catenin pathway on drug resistance of HCT-8/5-Fu cells(x±s, n=4) Western blot was used to detect the protein levels of β-catenin expressed in the whole cells and the nucleus (A), as well as c-Myc and cyclin D1 (B) expressed in the whole cells. After treating with 10 μmol·L-1 XAV939 on HCT-8/5-Fu cells, the protein levels of β-catenin expressed in the whole cells and the nucleus (C), as well as c-Myc and cyclin D1 expressed in the whole cells (D) were validated by Western blot. E: MTT assay was used to detect the IC50 after treating 10 μmol·L-1 XAV939 on HCT-8/5-Fu cells. *P < 0.05 vs HCT-8/WT; #P < 0.05 vs HCT-8/5-Fu. Fig 3 Effect of XAV939 on migration ability of HCT-8/5-Fu cells (x±s, n=5) After HCT-8/5-Fu cells were treated with 10 μmol·L-1 XAV939, the ability of migration of cells was measured by Transwell assay (A) and wound healing assay (B), respectively. Scale bar=200 μm. *P < 0.05 vs HCT-8/WT; #P < 0.05 vs HCT-8/5-Fu. Tanaka S, Sakai A, Kimura K, et al. Proteomic analysis of the basic proteins in 5-fluorouracil resistance of human colon cancer cell line using the radical-free and highly reducing method of two-dimensional polyacrylamide gel electrophoresis[J]. Int J Oncol, 2008, 33(2): 361-70. 陈淑娴, 叶向晖, 王叙, 金坚. CMPK1蛋白与阿霉素引起的多药耐药的相关性研究[J]. 中国药理学通报, 2017, 33(6): 788-92. Chen S X, Ye X H, Wang X, Jin J. Relationship between CMPK1 protein and ADM multidrug resistance[J]. Chin Pharmacol Bull, 2017, 33(6): 788-92. 雷涛, 陈万青, 张思维, 等. 1988-2002年中国10个县市大肠癌的流行特征[J]. 中华肿瘤杂志, 2009, 31(6): 428-33. Lei T, Chen W Q, Zhang S W, et al. Prevalence trend of colorectal cancer in 10 cities and counties in China from 1988 to 2002[J]. Chin J Oncol, 2009, 31(6): 428-33. Senfter D, Holzner S, Kalipciyan M, et al. Loss of miR-200 family in 5-fluorouracil resistant colon cancer drives lymphendothelial invasiveness in vitro[J]. Hum Mol Genet, 2015, 24(13): 3689-98. Chinese Pharmacological Bulletin, 2018, 34(8): 1083-1087.